SpaceX's Dragon cargo ship is captured by the International Space Station's robotic arm in this view from an exterior camera on April 10, 2016. The unmanned Dragon delivered 7,000 lbs. of supplies to the space station for NASA. A SpaceX Dragon cargo spacecraft arrived at the International Space Station today (April 10) to deliver vital supplies, science experiments and a prototype inflatable space habitat for the orbiting outpost and its six-person crew. Launched on Friday (April 8) from the Cape Canaveral Air Force Station in Florida, the Dragon pulled up to space station on this morning where it was captured by the orbital complex's Canadarm2 robotic arm. 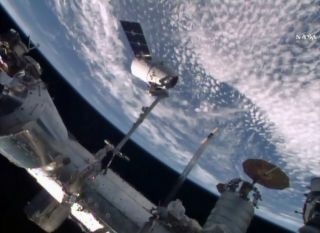 The Dragon's arrival marked the first time that two U.S. commercial spacecraft were berthed to the space station simultaneously. Orbital ATK's "S.S. Rick Husband" Cygnus cargo carrier launched to the station on March 22 and was attached to the Earth-facing port on the Unity module four days later. This unprecedented view shows SpaceX's Dragon cargo ship (left), Orbital ATK's Cygnus ship at center and Russia's Progress cargo ship at far right after the Dragon's docking on April 10, 2016. It's the first time two private U.S. cargo ships have been together at the station. In between the two U.S. arrivals, Russia launched its own Progress resupply ship on March 31. It docked at the rear port of the Zvezda service module on April 2. As such, there are now a total of six visiting vehicles at the space station, including the Dragon, the Cygnus, two Progress and two Russian Soyuz spacecraft. "A cornucopia of cargo craft now at the International Space Station," NASA spokesman Rob Navias said during docking commentary today. The record number of vehicles berthed and docked to the space station has only been matched one time before, when the space shuttle Discovery docked to the orbital complex during its final mission, STS-133, in 2011. In addition to launching Dragon to the space station, SpaceX also landed its Falcon 9 rocket on a drone ship for the first time during this delivery flight. Working inside the space station's multi-windowed Cupola, Peake commanded the 60-foot-long (18 meters) Canadarm2 robotic arm to reach out and grab hold of the Dragon capsule. The Dragon's capture came at 7:23 a.m. EDT (1123 GMT). It was firmly attached to its berthing port on the Harmony module just over 2.5 hours later. With the Dragon's arrival came almost 7,000 lbs. (3,175 kilograms) of cargo, including 3,800 lbs. (1,700 kg) of crew supplies, spacewalk gear and science experiments. The new experiments will help investigators assess the impact of antibodies on muscle degradation, seek insight into the interactions of particle flows at the nanoscale level and use protein crystal growth in microgravity to help in the design of new drugs to fight disease. The Dragon is also delivering "Tokyo Bekana" Chinese cabbage and "Outredgeous" red romaine lettuce seeds to be grown in the space station's Veggie chamber. The plants, selected for how well they grow and taste, as well as their nutritional value, will be the second crop of vegetables to be cultivated and consumed by the station's astronauts, should they grow as expected. Bigelow Aerospace's BEAM expandable module will enhance the living area of the International Space Station. See how the BEAM module works in our full infographic. Also aboard the Dragon, packed inside its unpressurized trunk section, is BEAM — the Bigelow Expandable Activity Module — an experimental inflatable space habitat that will be attached to the aft port of the Harmony node. Designed by Bigelow Aerospaceand based on a NASA concept for expandable habitats, the BEAM will allow investigators to gauge how well the module protects against solar radiation, space debris and contamination, paving the way for the future, much-largerinflatable space habitats. The space station's robotic arm will be used to extract the deflated BEAM from the Dragon's trunk and attach it to the orbiting outpost for a two-year test. BEAM will then remain in its unexpanded form until late May, when it will be inflated to a size four times its launch volume, or about the size of a small bedroom. "The inflation is probably not until the end of May, somewhere around the 25th, 26th of May," said Shireman. "There is a lot of work involved in preparing for that and we also want a good quiescent period on board the International Space Station." Robert Pearlman is a contributing writer and the editor of collectSPACE.com, a Space.com partner site and the leading space history news publication. Follow collectSPACE on Facebook and on Twitter at @collectSPACE. Follow us @Spacedotcom, Facebook and Google+. Original article on Space.com.